From Vancouver to St. John's, thousands of Canadians showed their support this past weekend for the 22nd annual Parkinson SuperWalk, the largest fundraiser for Canadians living with Parkinson's disease. More than 14,000 walkers, volunteers, donors and sponsors helped raise $3 million in 95 communities across Canada as final results continue to be counted. "We are touched and inspired that so many Canadians from coast to coast supported Parkinson SuperWalk, especially our newest walkers. Thank you for helping us reach our $3 million fundraising goal. Together, we are making a difference," says Joyce Gordon, Parkinson Society Canada, President and CEO. One B.C. team, Hike for Hank, broke records by raising more funds than any other team across Canada this year and in the entire 22 year event history. The team, based in White Rock, raised an outstanding $86,970 which was matched dollar for dollar by Henry (Hank) Block who lives with Parkinson's disease, resulting in $174,970 toward support and services in that province. Proceeds from Parkinson SuperWalk help fund the valuable educational resources, support services and advocacy efforts provided by Parkinson Society Canada and its regional partners across Canada to individuals and families. Parkinson SuperWalk donations are also invested in the National Research Program that funds Canadian Parkinson's scientists who are helping us learn more about the causes of Parkinson's, develop better treatments and, one day, find a cure for the disease. You're never too young to be a SuperWalk champion. "As soon as I heard about Parkinson SuperWalk, I knew I had to get involved," said 11-year-old Jenna Sigurdson. Jenna's father Blair was diagnosed with Young Onset Parkinson's disease earlier this year. Managing Parkinson's takes more than a team of medical specialists. Blair benefits from the information resources, an exercise program and friendships he has made through Parkinson Society Manitoba, where he co-founded a Young Onset Parkinson's support group. Daughter Jenna's original fundraising goal was $1,000, but she increased it when donations poured in from generous friends and neighbours. By SuperWalk weekend, Jenna had raised more than $11,500. "When I participate in Parkinson SuperWalk I feel like I am doing something good, helping others and I feel like I'm making my dad proud of me," Jenna said. "I want to raise money to help find a cure for my dad, and I also want to help support other people with Parkinson's too." At Parkinson SuperWalk, Jenna proudly walked alongside her father Blair. Also there to cheer on The Young Onsets team were Jenna's mother Karren, brother Tyler and dog Ruby. 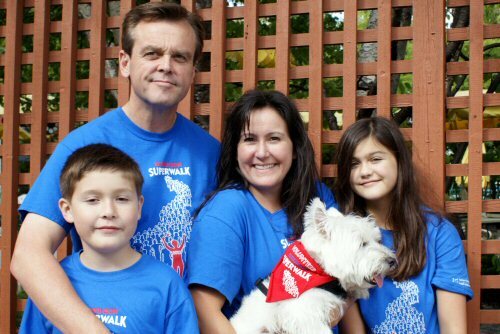 The Sigurdsons were one of many families at Parkinson SuperWalk with a canine companion. This year saw the launch of the Pets for Parkinson's contest. The contest asked Canadians to show support for the walk by submitting photos of their pets demonstrating enthusiasm for the Parkinson's cause. Pets for Parkinson's was a huge success thanks to many Canadians who shared adorable photos of their cats and dogs wearing SuperWalk T-shirts. The contest helped raise awareness about Parkinson SuperWalk and Parkinson's disease in Canada. Parkinson Society Canada acknowledges the generosity of Parkinson SuperWalk national sponsors: Teva Canada Innovation, Naturegg and Roots. Online donations for Parkinson SuperWalk will be accepted until October 1, 2012 at www.parkinsonsuperwalk.ca. Parkinson's is a neurodegenerative disease for which there is no cure. Parkinson Society Canada, through 10 regional partners and 240 chapters and support groups, provides education, support, and advocacy on behalf of over 100,000 Canadians living with Parkinson's. Funding innovative research helps expand knowledge on prevention, diagnosis and treatment of Parkinson's and will ultimately lead to a cure. To find out more about Parkinson's disease and services available near you, call 1-800-565-3000 or visit www.parkinson.ca. The Sigurdson family, Blair, recently diagnosed with Parkinson's, his daughter Jenna 11, who raised more than $11,500 herself, wife Karren, son Tyler and their dog Ruby all supported The Young Onsets team in their first Parkinson SuperWalk.